The key to surviving in Korea is mastering a language I like to call Konglish. Konglish is a language like English but spoken with a Korean accent. Example: if you get in a taxi and say “McDonald’s,” the taxi driver will stare back at you blankly. You then repeat it slowly, “Mc-Do-nald’s.” You then go into a miming game where you say “McDonald’s” slowly while airbrushing an “M” into the air in front of him. “Oh! McDonald-zuh,” he’ll repeat back joyfully. In Korean no word can end with a consonant sound. So, all words, including the entire Konglish catalogue, must end with a vowel sound. Another note, all the “L” sounds and “R” sounds are reversed. Also, in Korean they can’t pronounce the “F” sound. Instead, they convert all “F” sounds turn into a “P” sound. So, instead of saying refill, in Konglish you say, “Leepilluh.” These are the three most important rules of Konglish. Konglish is occasionally frustrating, often confusing, and almost always entertaining. 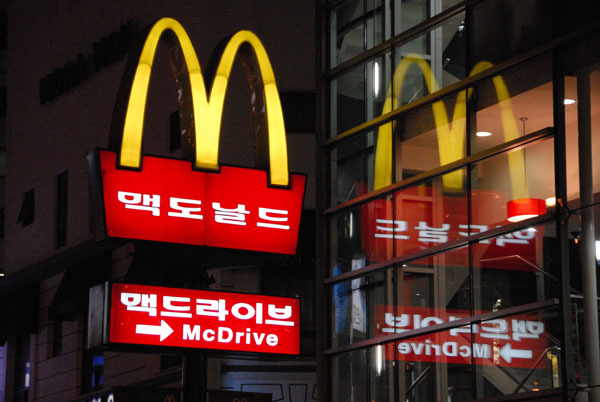 It’s one of the main reasons for misunderstandings between Koreans and foreigners. And for an English teacher, it’s a daily battle that will probably never be won. Some English words have been adopted by the Korean language, just as they are, to mean the things that they, really mean. Example: Game, Sticker and Computer. These are a few that English teachers pick up when listening to the Korean students talking amongst themselves. However, for the most part, most Konglish words have taken on new meanings, so that they now mean something completely different than they do to native speakers. Or, even more confusingly, there’s only a very slight, subtle difference. That’s Konglish; English words, but with a new Korean meaning. Here’s a partial list of Konglish words. Let’s Dutch pay!……………………….Let’s go Dutch! “Shouldn’t he have been able to guess what I meant when I said ‘White-out.’ The words are pretty close?” I thought to myself. If you start to wonder things like this in Korea, you will slowly go insane.